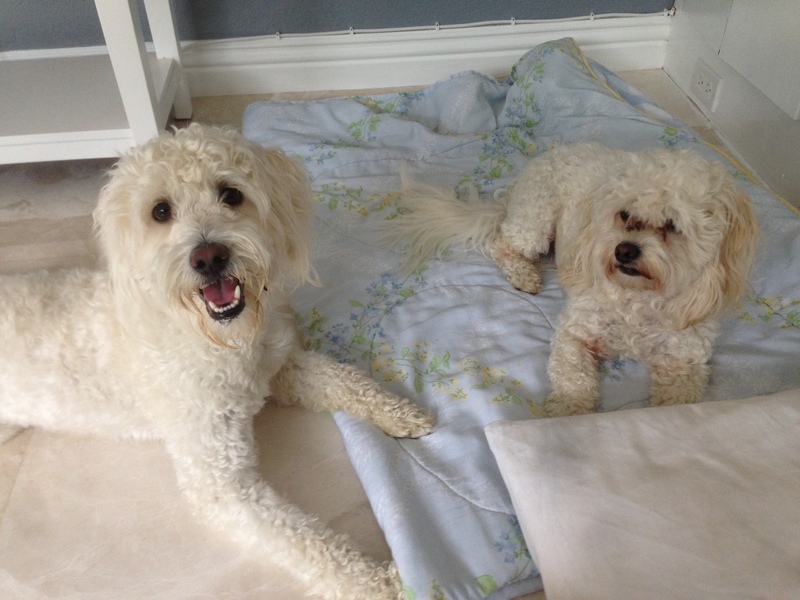 For this session I traveled to Burbank, CA to work with Charlie (left) and Max (right) a couple of poodle mixes who had taken over their home in many ways. Charlie was the most pressing dog as he had bitten a few visitors to the house and his aggressive behavior had resulted in his guardians limiting visits from family and friends out of concern that he may bite or nip them too. When I came inside Charlie made it clear he disapproved of my presence. He barked while offering direct eye contact, but after each bark he would back up a bit or look away. I kept him in front of me and slowly entered the house. My goal was to avoid him thinking of me as a threat, but also clear than I was not intimidated or going to back down. I methodically followed Charlie as he retreated away from me, his barks loosing umph as we went along. Eventually he backed himself into the kitchen so I stopped about 10 feet away from him Once we were at this distance, he stopped his barking. I paused for a moment, waiting for a sign that he was relaxing a bit more. After about 60 seconds he sat down and a half minute later he exhaled a little bit and his body loosened up a little. I took a deliberate but slow step towards him and then paused. He shifted his weight a bit, but stayed sitting down so I took another step. I kept approaching him this way until I was only a few feet away. I extended the leash I was carrying and offered it to him. He moved his head ever so slightly and I saw his nostrils flare as he got a whiff of the other dogs who I had used the leash with. Only after he finished his nose inspection did I slip the leash over his head and lead him back into the living room. I sat down with his primary guardian and discussed the dogs behavior and the structure and routine of their day to day life. While we were talking, Max jumped up on the sofa next to his guardian and then proceeded to climb into her lap. When a see a dog climb onto my client’s body, I know the dog doesn’t hold the proper respect for the human’s authority. I suggested that their guardian adopt the no free lunch method and only pet their dogs with a purpose like sitting or laying down. Not only does this put the dog into a more subordinate body position, it helps define a healthier leader follower dynamic. 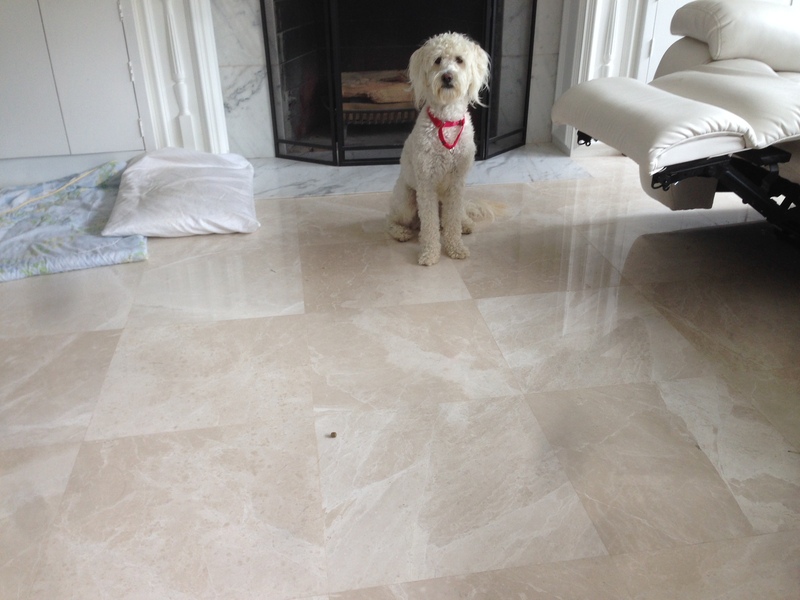 Next I went over a leadership exercise that asks the dog to leave alone a high value treat laying in the middle of the floor. It only took one correction to get Charlie to understand I wanted him to respect a 4 foot boundary from the treat. A minute later Charlie took a seat. As soon as Charlie started to sit down, I took a sudden and deliberate step backwards. By moving away from the treat at the same time Charlie sat down, I was telling him I agreed with his showing he wasn’t challenging for the treat. After sitting and looking at the treat for a minute, Charlie moved to his blanket a few feet away and laid down. This was his way of telling me he understood the treat was not for him. As soon as Charlie laid down and gave up, I walked over to the treat, turned to my side, kneeled down then tapped behind the treat to tell Charlie he could have it. I wanted him to understand that giving up on the treat was something that earned him a reward. I suggested his guardian and all the members of the family practice this exercise one or more times a day. I also showed her how to make the exercise more difficult by adding time. By gradually increasing the amount of time we ask the dog to wait before we give it the treat (after it has laid down), we can help the dog develop the ability to restrain themselves. This ability will help the dog in a wide array of situations; running after another dog, barking at sounds or things that surprise it, charging the door when he hears anyone knock, etc. I also went over some non verbal communication methods as well as new ways to disagree with unwanted behaviors. I also suggested some new rules and limits that will help the dogs see a distinction between them and the humans in the home. Assuming a leadership position in the dogs eyes is a big part of the rehabilitation process. We decided to take a break and let the dogs out into the back yard to relieve themselves. While we were waiting on the dogs, their neighbor came out into the back yard and Charlie started to bark as soon as he heard her voice. As I made a movement to disagree with his outburst and stop his barking, his guardian mentioned he was so aggressive to the neighbor that she hadn’t ever really met the dog. This was a great opportunity to teach Charlie how to properly meet people so I invited the neighbor over. I placed Charlie on a leash to ensure everything would be safe. As soon as the neighbor came through the fence gate, Charlie started to lower his head and look at her to the side. As soon as he made this movement I gave him a correction that completely snapped him out of it. I had the neighbor come into the middle of the deck and stand still a few feet away from the dog’s guardian. I had placed Charlie into a sitting position and once he was settled and completely calm, I walked him a few steps closer to the neighbor before returning him to a sitting position. He remained calm with a nice loose body posture and was looking around casually so I took another few steps until we were right next to the neighbor. A minute later Charlie started to pick up her scent and his nose led him toward the neighbor. He gave her a couple of nice sniffs then looked away and relaxed even more. At that point I told the neighbor she could pet him, but not to say anything. The neighbor had a bit of a sing song verbal delivery and that can sometimes add excitement. While humans often think this quasi baby talking style is more appealing to dogs, it can add extra energy to a situation. Dogs don’t communicate verbally, so additional sounds can be distracting and sometimes even negatively impact the situation. Additionally it actually makes things more challenging for a dog as they don’t hear words. They yea the sound of words. So “Charlie you are being such a good boy” and “Chaaaaarleeeey, yoooooou are being suuuuuuuuuch a goooood booooooy” sound like two completely different things to a dog. So if you baby take your dog, do it a favor and keep the normal enunciation. I can assure you, your dog will thank you for it. After a moment I was comfortable enough to drop Charlie’s leash and let him move about as he liked. He spent a few moments getting petted by the neighbor while my client stood a few feet away saying “I can’t believe he is letting you let him.” After a few minutes, she mentioned how the only thing that would be better would be to have they neighbors dog over too. The neighbors dog (who could pass for a member of Max and Charlie’s family) liked to play with Max. But Charlie was a different story, acting aggressively and trying to attack the neighbors dog so they had kept them apart. Because Charlie was doing so much better after the work we had already put in, I had the neighbor go home to get her dog. After she left, I put Charlie back on a leash and put him into a sitting position. I had the neighbor enter slowly with her dog on a leash too. 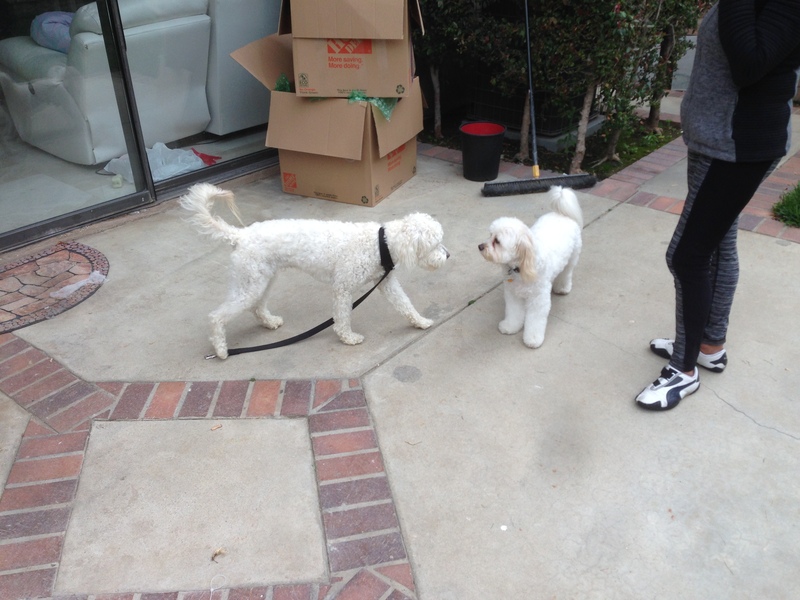 I watched Charlie as they came closer and gave him a small correction the second he saw the other dog. This put him back into a sit. I had the neighbor come over gradually, pausing every few feet until he dogs were a few feet from one another. I moved Charlie into a position so he was facing away from the dog hoping the other dog would come over and sniff Charlie’s rear. When dogs are first meeting one another in person, the dog who is sniffed first is more subordinate. I wanted to make sure that dog was Charlie. Charlie turned a bit to the side and saw that the neighbor dog was sniffing him. He started to stiffen but as soon as I caught it, I gave a correction that settled him back down. After the neighbors dog moved away, I brought Charlie up to his rear end so he could properly meet the neighbor’s dog. After getting a good sniff, Charlie turned and walked away completely relaxed. Once I saw that was the case, I dropped the leash. Charlie wandered around then came back over and moved face to face with they neighbor’s dog. This was an advanced situation as dogs don’t usually meet face to face and with reactive dogs, that sort of approach can be considered an intrusion so I was monitoring them closely. Fortunately Charlie was well mannered and the encounter proceeded without incident. 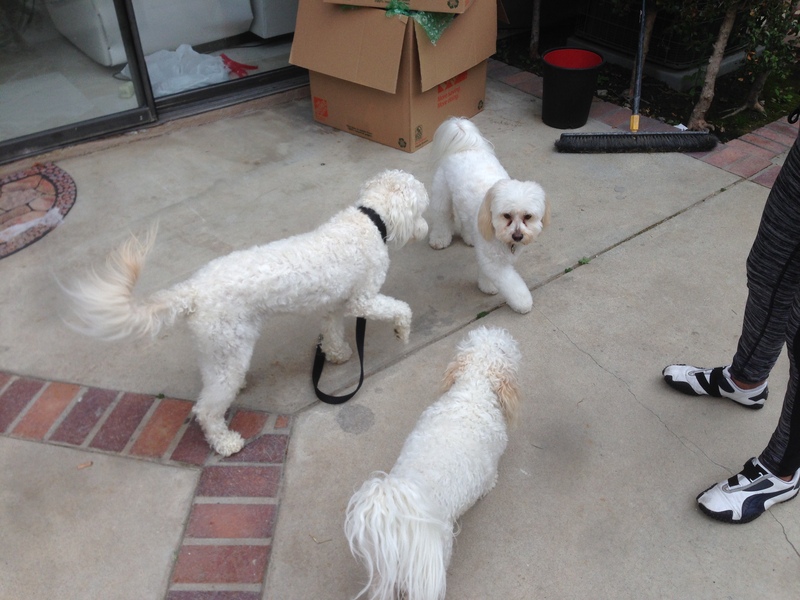 After some deeper sifting, the dogs started to move around one another and Max joined the group. 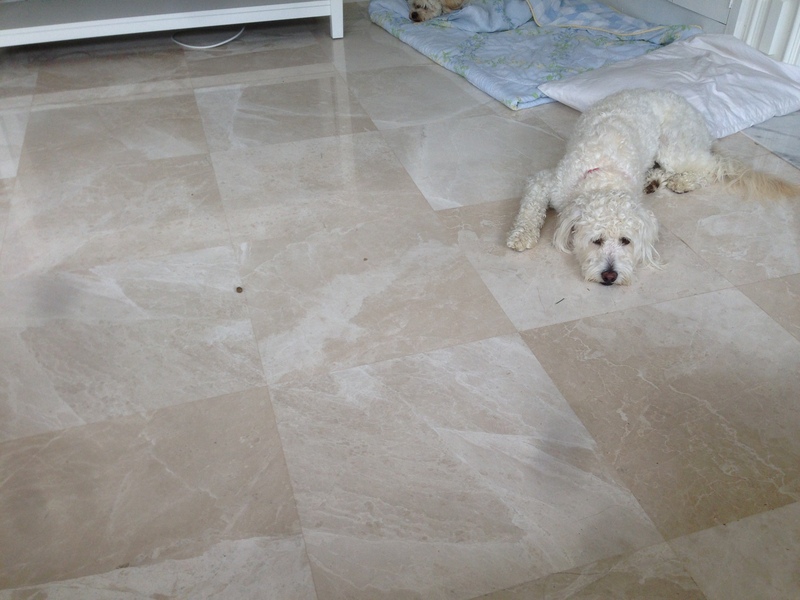 All three dogs were relaxed and showing good body posture and energy, thats when I saw it. Charlie lifted his front left paw in a pointing position. To dogs, in some situations, that paw lift signifies that the dog is comfortable with the other dog and is inviting it to come closer. This was a big sign and step! A minute later the dogs moved onto the grass and started to play with one another. As they grew more comfortable, the play become more advanced. A short time later all three dogs were running around chancing and playing with one another. This was the first time all three dogs had been together and they weren’t just having out, they were tearing it up. I flipped over to video on my phone to capture the moment and watched the dogs running aorudn playing with each other. Both my client and her neighbor were laughing and saying who they could believe what they were seeing. For most people its not usually a good sign when your client starts to cry, but not for me. My client was was so overjoyed at seeing her dog do something she didn’t think was possible that she literally broke down crying. Looking over and seeing her neighbor hugging her as they both drank in the joy the dogs were sharing… one of the better moments I have had as a dog behaviorist. After letting the dogs play for a good twenty minutes, the neighbor and her dog bid us farewell. I wanted to seize the momentum of progress we had achieved so I fitted Charlie up with a Martingale collar and we set off for a short walk around the neighborhood. I went over how to hold the leash and when to apply corrections before walking Charlie in front of her house so she could see how to lead him using the Martingale. As usual, the twist to the leash and Martingale collar stopped the pulling straight away. Their guardian hadn’t been walking the dogs lately due to Charlie’s severe reaction to dogs and some people in the neighborhood. 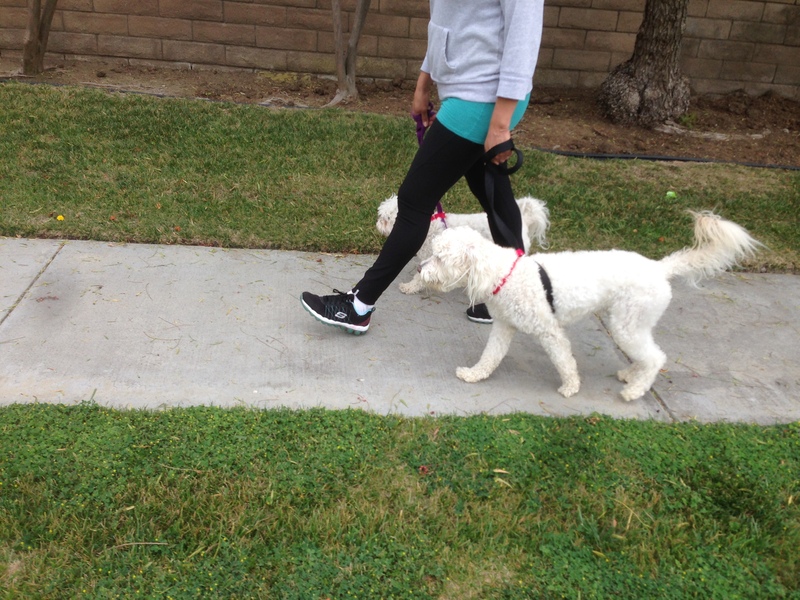 As we made our rounds, the dogs stayed in a heel position with only the occasional correction needed. We ran into neighbors that Charlie would have barked at or lunged for, but not this time. He hardly paid them attention and remained completely relaxed. Even when we walked up the driveway to the fence of a neighbors dog that Charlie had the strongest reaction to, his guardian controlled the dog and situation with ease. As we walked back to the house, the dog’s stayed in a perfect heel position the entire way. Their guardian kept telling me how she could hardly believe that Charlie was doing so well on the leash. While the Martingale helped with the pulling, his guardian was walking tall. You could see and feel her confidence level was high and the dogs were absolutely responding to it, walking next to or behind her on their own. By the time we finished the session, both dogs were regarding and responding to their guardian with a high level of respect. They were following commands quickly and needing fewer and fewer correction. It will be extremely important that the members of the family continue to practice the exercises we leafed along with leading their dogs by enforcing rules, boundaries and timely corrections before these new behaviors become permanent. But based on how far we came in the course of a few hours, I don’t think it will be long before Charlie’s aggression only exists in memories.